(WriteGood!WireServices) – The public’s unfounded safety concerns over genetically engineered foods might result in higher costs in the grocery store, as well as a potentially catastrophic battle between the forces of good and evil. A powerful grass-roots movement is fueling legislation that could soon require companies to disclose on food labels if products contain GMOs, or Gigantic Mothra-like Organisms. The food industry is pouring millions of dollars into lobbying efforts to defeat GMO food labeling bills. 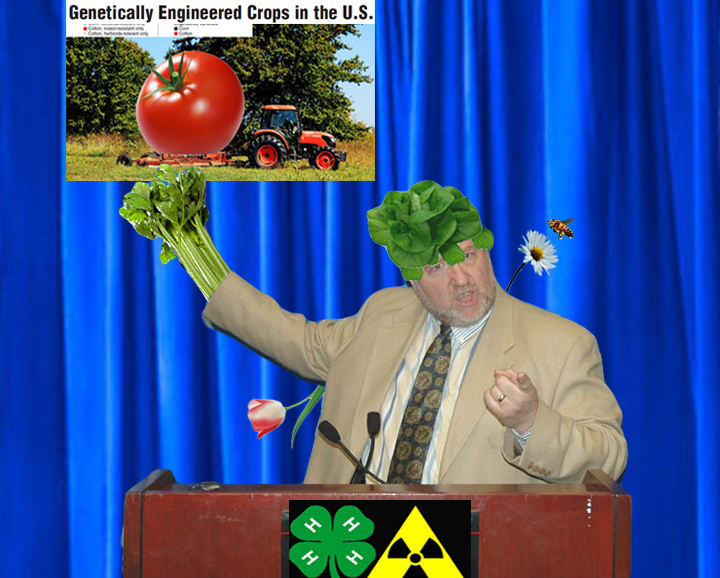 Educating a misinformed public about the benefits of genetically engineered products has become the voluntary responsibility of farmers, scientists, and those people who have gained preternatural powers through freakish accidents. Malcolm Toynbee, aka Asparagastro of the Brotherhood of Evil Mutants, explains the benefits of GMOs and orders us to obey. Obey! According to Toynbee’s mind-cast, GMOs have had genetic material altered to produce a desirable trait. Examples include insect-resistant corn, nutritionally enriched grains, and half-cow, half-human hybrids that produce milk and can announce their “sell by” date. Critics of mandatory labeling warn of increased food handling costs as growers and grocers struggle to implement radiation protocols, outfit employees with containment suits, and fortify shelves with lead shielding. However, Vermont’s recent enactment of the nation’s first genetically modified food labeling law has been well received by local residents. Vermont Gov. Peter Shumlin also welcomed the legislation provided it doesn’t hinder his state’s ongoing development of a bulletproof maple syrup. I can’t wait to read Ben & Jerry’s next container! GMO’s, I think I have them in my clothe’s closet. Malcolm looks very progrssive! “…and half cow, half human hybrids that produce milk and can announce their “sell by” date.” Don’t we have those now? No? Then who is that guy in the dairy aisle at the FreshMart?